This is one of those delicious Greek-style dinners that’s sure to please…what’s not to love about juicy chicken thighs marinated in a lemon-garlic sauce? 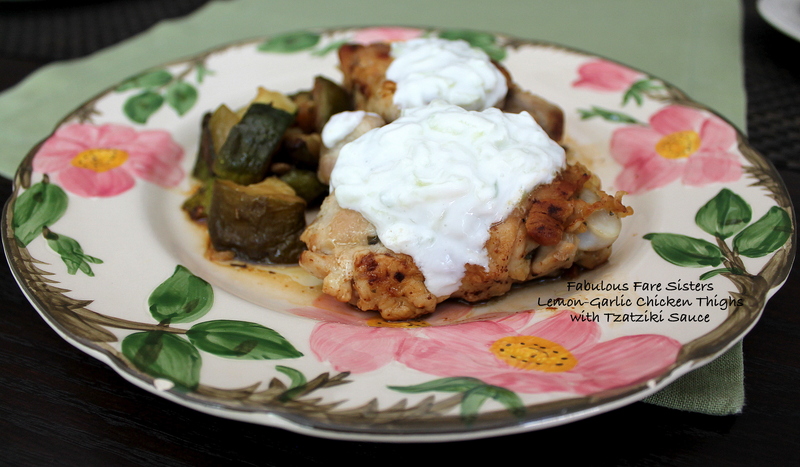 Braised in that same lemon-garlic sauce along with fresh zucchini and then grilled for the final minute or two to give them those beautiful grill marks – brushing them with the sauce along the way…then topping it all with a cool Taztziki Sauce…tasty perfection! Place the chicken thighs in a large mixing bowl. In a small jar with a lid, combine the lemon zest, lemon juice, fresh oregano, minced garlic and salt with 2 tablespoons extra virgin olive oil. Put the lid on and shake vigorously. Pour onto chicken thighs in bowl and toss to coat. Heat a large skillet with a little extra virgin olive oil. Put the chicken along with the lemon-garlic sauce in the hot skillet; cover and cook about 6 minutes on medium to medium-high heat; turn chicken thighs over, cover and cook another 6-8 minutes. Add in the zucchini chunks and cook until chicken is almost done. Make the Tzatziki Sauce. Combine all Tzatziki Sauce ingredients in a bowl and mix well; set aside. Heat a large grill pan and transfer chicken thighs to grill pan; cook another minute or two on each side, brushing with the pan drippings. Remove thighs to a platter and scoop zucchini onto hot grill pan for another minute or two. 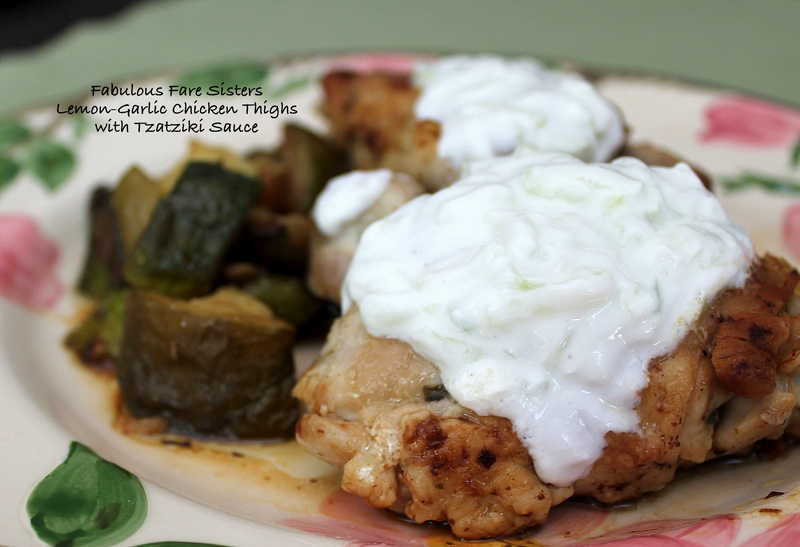 Spoon some Tzatziki Sauce on chicken thighs when serving. This recipe is exactly what I was looking for! I have so much dill left over from my garden 🙂 Thank you so very much!!!! !